Red River Blog Jam: Live! We wanted to pay our water bill online but that link wasn't working. 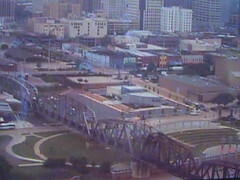 However, we did find a live webcam of downtown Shreveport. Our favorites? Woody and Cabbage-like (personally, RRBJ wishes downtown smelled more like cabbage -- it would remind us of the tasty Mulligan Stew our Irish great-grandmother made).